The new blanket introductions are always a a highlight here at Pendleton. We work on these designs for a full year before we ever see a sample roll off the loom. Something magical happens when flat, fine-edged designs are woven in wool. The patterns we thought we knew are that much more breathtaking when translated into textile form. It is always exciting and a little mysterious. If you’ve pored over out website or catalog, then come into a store to see a blanket in person, you know exactly what we’re talking about. There is a depth and beauty to a blanket that’s truly breathtaking. Well, wait no more! The new blankets are up at pendleton-usa.com. We have some beautiful new room settings to inspire you. 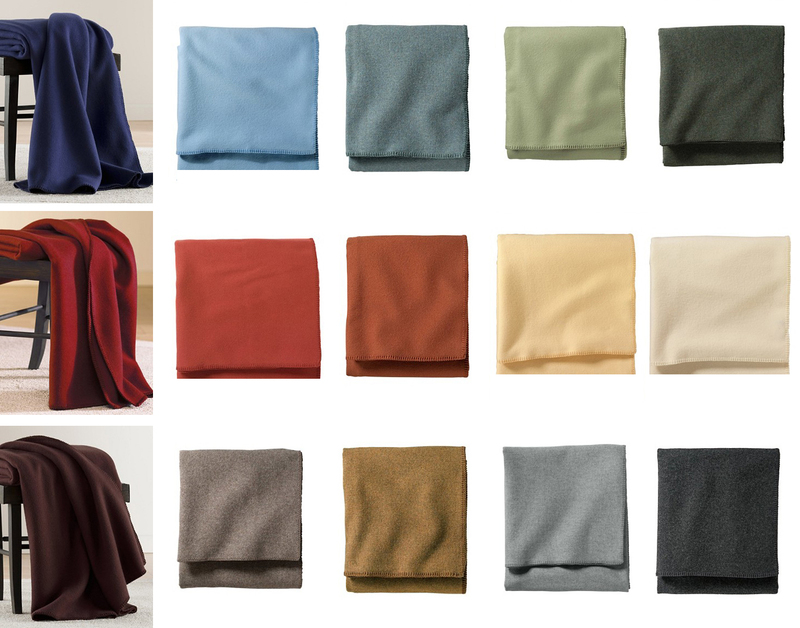 The blanket names are linked, you can click for more information at our website. Do you like warm colors and sinuous lines? Topeka Plains might be your pattern. The Great Plains cover over 500,000 square miles of North America. Long ago, this vast expanse of steppe and grassland was covered by tall grasses that supported the Plains Bison. The Bison in turn supported the way of life of nomadic tribes that hunted and farmed the prairies, including Blackfoot, Cheyenne, Pawnee, Crow, Comanche, Arapaho and many more. Topeka Plains pays tribute to the waving grasslands of the Great Plains with a harmonious pattern of sinuous lines. The balance of this banded design reflects the balance of life among the Nations of the Great Plains. Cactus Trail is another colorful pattern, with primaries set off by a background of Oxford grey. It’s a tribute to the Cactus to Clouds Trail in California. Jagged white peaks rise beside rows of Saltillo diamonds representing desert flora–Cholla and Barrel cactus, Banana Leaf yucca, Ribbonwood trees, Pinyon pines, Manzanita and scrub oak. Steps and hooks symbolize a path travelled partly in darkness. This is the Cactus to Clouds Trail, an 18-mile hike rising 10,300 feet from Palm Springs, California, to San Jacinto Peak. Built by the Civilian Conservation Corps during the Great Depression, it is privately maintained by local hikers who install markers and maintain water caches along a challenging trail with the greatest elevation increase in the United States. Infinite Steps (on the wall) is part of our new contemporary collection. Through careful arrangement of color and shape, Infinite Steps creates a three-dimensional staircase on a two-dimensional plane. This is an optical illusion–an illustration that tricks the brain into seeing what is not actually there. The traditional craft of quilting uses many optical illusions in its patterns, such as Carpenter’s Color Wheel, Tumbling Blocks, Pinwheels and variations of the Log Cabin pattern. Infinite Steps pays tribute to the precision and planning quilters use when creating these dazzling effects. Boro Patchwork is also part of the contemporary collection. Boro patchwork reflects the value of ‘mottainai’ or ‘too good to waste.’ The word Boro, meaning ‘rags,’ describes items of clothing and bedding that have been patched and repaired many times. Boro clothing was worn by peasants, merchants and artisans in Japan from the Edo period through the early Showa period. Patches are often worked in hishizashi, personal stitching patterns developed by menders. Some Boro items are sewn through generations. The beautiful indigo shades of repaired cotton and rough-spun hemp work together in a subtle patchwork that reflects a culture’s devotion to preservation. That is just a taste of what you will be seeing at pendleton-usa.com . Visit us often to see what’s rolling off the loom at our USA mills! Happy New Year! It’s going to be a wonderful year to travel our National Parks, thanks to the centennial of the National Park Service. To inspire your own travels, we have a guest blogger from Germany, Eva Maria Kindler. Eva tells the story of her love affair with a vintage Range Rover, and how a side trip from her family’s vacation to America’s wilderness areas resulted in some beautiful inspiration. Today, I am giving you a free pass to my feelings. A story about true love and a passion that I am losing my head over. It’s, of course, about a car. Only love makes a few thousand dollars annually at the repair shop and seven gallons per 60 miles tolerable (I know, this might not be much for an average American car, but for us Germans that’s A LOT). I bought it for only $1,000 and a bottle of Tanqueray Gin from the owner of Chelsea Farmers Club in Berlin, a quirky British Concept Store. Besides, the carbon footprint of this old car gets better every day. In fact, it’s about something else: (under)statement, British lifestyle and the successful and credible synthesis of Salon and agricultural utility-vehicle. The Range Rover Classic (RRC). Many praises are sung of the Range Rover Classic as the first, true SUV on this planet. I am not dwelling on that. It’s simply a cool ride. It has character: attractive, comfy, with plenty of room (again, for a British car) and a survivor. Perfect for pulling out bushes in the garden, which I’ve done several times. By the way, my car is from 1994, but looks 20 years older. Only a car is allowed to do that. This year, I was up for something crazy. That is, taking out the door mats to see what was underneath. Long story short: it was painful and costly. But the whole six weeks in car rehab were all worth it. The RRC came back fresh and strong in a beautiful matte-green finish (it took me 2 months and 5 cans of spray paint to find the right tone). While the car was having its face lift, we took a six-week family road trip throughout the American Northwest and the Rocky Mountains. We had a lot of time to think about the inner beautification of the car. The roof lining was hanging down. So we asked ourselves the question, how, from a design perspective, the iconic British fits together with something truly American. Or: do Native American-inspired patterns go with a British National Monument? Of course! So we took a little detour to Pendleton Woolen Mills and bought 7yd 2ft of heavy wool fabric and took it back to Germany. Typically, the fabric suitable for the roof and door lining is as thick as a t-shirt. We took a wool blanket to our local saddlery and asked them to do the job. What can I say! They did a great job. The result is better than we expected. We call it the Range Rover Classic Pendleton Edition. Tomorrow, I am taking the car back to the repair shop. There are new things to be fixed. I drive the car to the garage, and jog back. Doing something for the Carbon Footprint! In the spirit of love, here’s a little video shot when Curtis Kulig visited our mill to see his collaborative blanket in production. From us to you with a little help from Curtis, Happy Valentine’s Day. 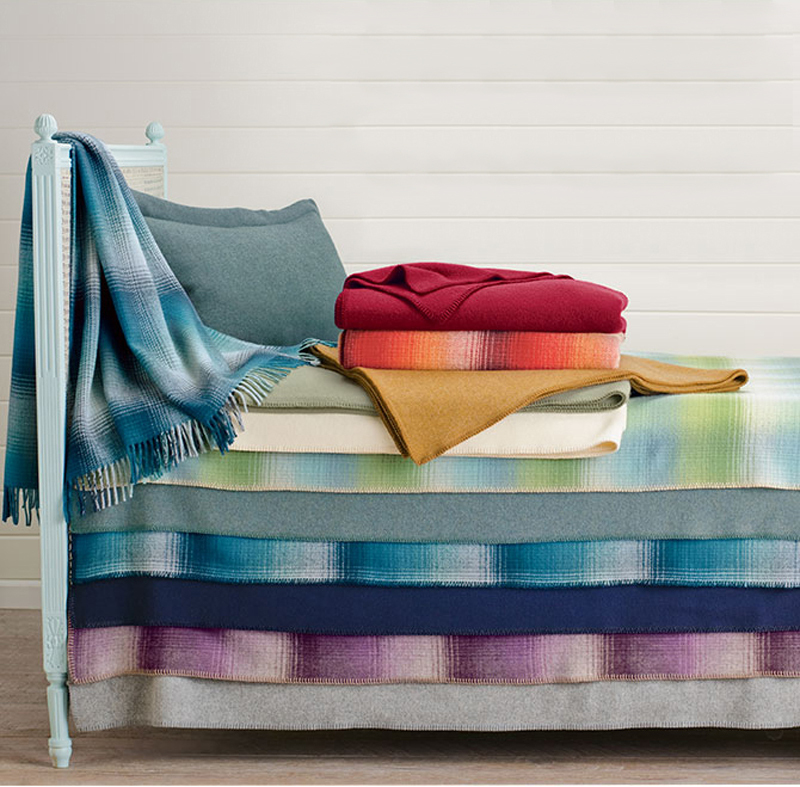 We are Pendleton Woolen Mills, and wool is what we do. Just watch and listen to Cameron Krebs, a wool grower from Umatilla County, talking about his family’s generations as wool providers to Pendleton Woolen Mills. So here are some amazing wool facts for you, courtesy of us, from our trusty “Wool, A Natural” booklet, a little classroom staple for many years now. Wool is a natural fiber, growing from the follicles of sheep. In a time of sustainability and environmental consciousness, this renewable resource remains longer-lasting and better looking than anything man-made. Even though advanced processing methods have made wool more versatile and easy care, man has not improved the miracle fiber itself. This is due to the ability of the fiber to spring back into shape after bending, creasing, or compression. Resilience gives wool its ability to hold a shape, resist wrinkles and withstand wear. This makes wool great for travel. It resists tearing because it’s flexible. Wool can bend back on itself 20,000 times without breaking (cotton only 3200 times before breaking/silk 1800 times/rayon only 75 times). Wool can be stretched or twisted and its cells return to their original position. Wool fibers cannot be packed down. They spring back to shape keeping their open, porous nature. Wool provides the most warmth with the least weight. The air that is trapped inside (about 80% of wool fabric volume) makes wool an excellent insulator to keep the body at its normal temperature year round: warm in winter and cool in summer. Wool is the original outdoor “performance” fiber. Wool repels light water, like a rain shower, because of the membrane on the outer scales. In very wet conditions, wool absorbs up to 30% of its own weight without feeling damp. And because of insulation ability, wool “breathes,” allowing the body’s natural moisture to pass through. The hairy surface of wool and its freedom from static make it the easiest of all fabrics to keep clean or to clean after soiling. Wool has a permanent natural luster it never loses even after years of hard wear. It absorbs dyes until it is completely saturated so colors stay brilliant in spite of sunshine, perspiration and impurities in the atmosphere. No other fiber can be spun or woven into such a variety of weights, textures, finishes and colors. Unless it is in direct contact with flame, wool will extinguish itself. The denser the weave and the greater the fabric weight, the less likely it is even to char because of its smaller oxygen content. Fire departments and insurance companies recommend the use of wool blankets, rugs or coats to put out flames. We will be bringing you more fun facts about wool this month, because January is an excellent month for keeping warm. And thanks to the Krebs family for their participation in this video! When we opened our store at the Portland International Airport, we partnered with the Port of Portland, which oversees our city’s commerce by river, rail, road and plane. The airport location has given us a wonderful opportunity to share our very-Oregon brand with the rest of the country as it passes through PDX (which is what we call our airport, for you out-of-towners). 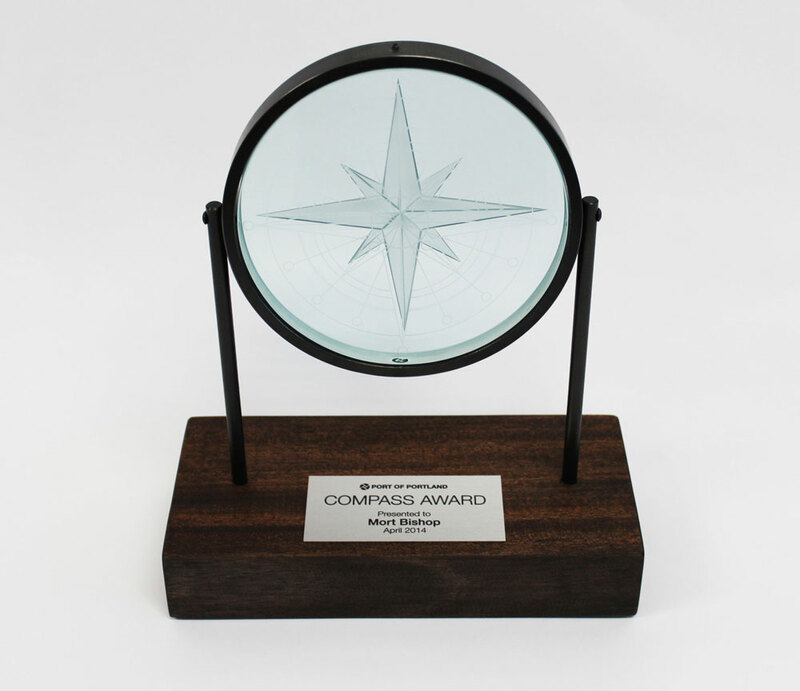 The Port recognized our association with the Port of Portland 2014 Compass Award at the recent “Tradition of Trade” annual luncheon. More than 500 business leaders, elected officials and community stakeholders attended this year’s Gateway to the Globe luncheon. 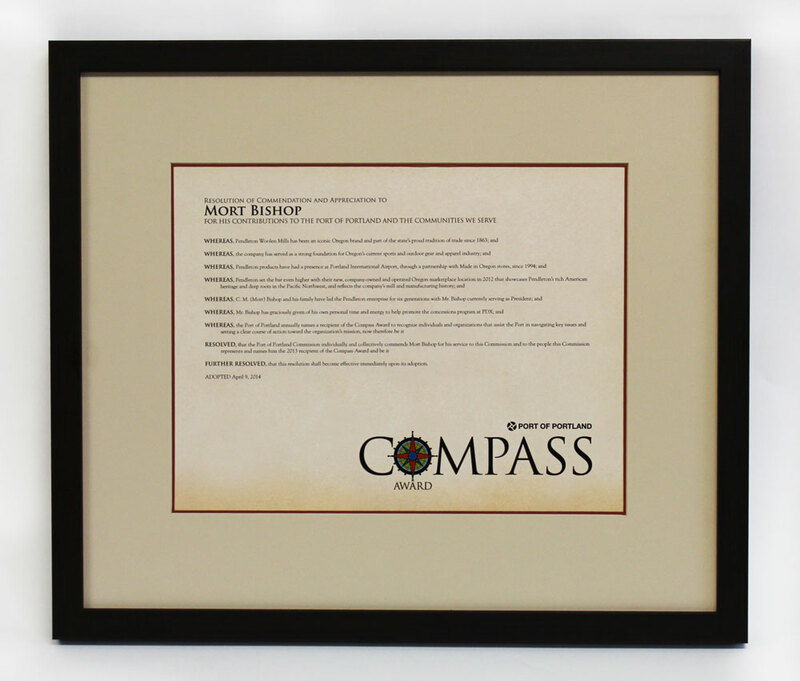 It was quite an event, and the Compass Award is quite an honor.